A quick tutorial on how to use pathgrids in Morrowind. 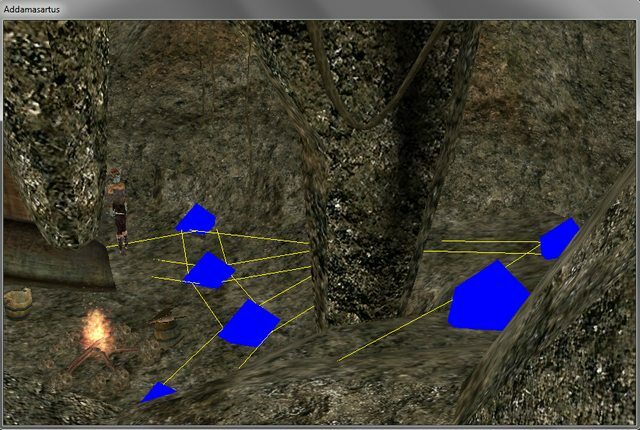 Note that Oblivion uses the same pathgrid system and the interface in Oblivion's CS is identical. 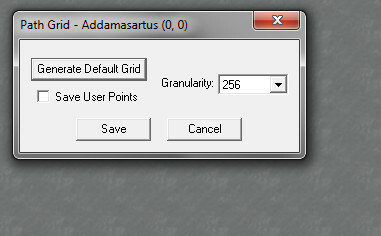 <> A. Click on the Pathgrid icon or use World->Edit Cell Path Grid. <> B. This will bring up a small window. Generate default grid isn't interesting, as it will make the same mistakes as the AI. Granularity defines the size of the squares created by the red path nodes (red == default) when a default path grid is generated. Save user points seems to have no purpose, user points are always saved anyway. You can check it just to be sure. <> C. So, leave the path grid window open, and go to your render window. 1. Path nodes can be selected and moved just like any other items. 2. However, they can't be rotated. (That would be useless anyway.) A right click creates a new path node. 3. Default path nodes are red, custom path nodes are blue. Moving a red node turns it to blue. 4. Path nodes can be deleted just like items, with the delete key. 5. In this mode, it's the selected node that is used as the pivot point when rotating/centering/etc. the view. 6. With a node selected, ctrl + left click on another connects both; or if they're already connected, disconnects them. 7. Pathways and path nodes are especially useful at places where the AI has trouble navigating. A flat, large, straight hallway without obstacles won't even need one, but a place with stairs, door jambs, ramps, and other obstacles will need a detailed grid. As you see, the grid follows the ledge leading to the entrance. If you delete this in a test esp, then start a new game with that esp, you'll notice that the smuggler in the first piece won't react adequately. Attack her from the entrance with ranged weapons, and she'll charge straight at you and get stuck in the elevation. With the path grid, she knows that to reach the entrance she has to pass through the ledge. <> D. Finally, once you've made the path grid for your cell, click on Save. 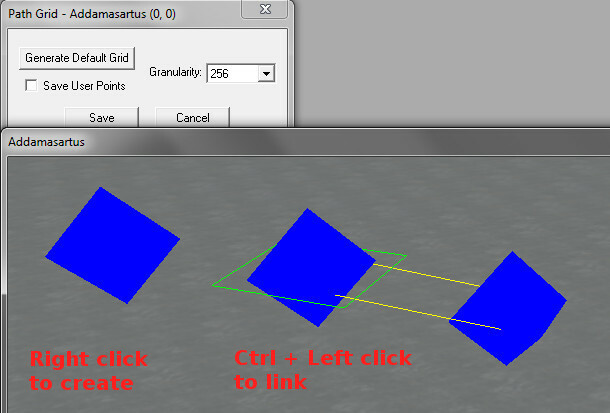 This saves your path grid and closes the path grid window, returning the render window to its usual mode. Everything works in pretty much the same way as in Morrowind. Automatically generated points are now orange, though, and the blue color is reserved for the "best path". NPCs will try to follow the best path to their destination. To mark a path node as being along the best path, press Alt and click on it. Unmarking it works in the same way. It is also possible to clearly separate parts of the cell with subspaces (link is external) so that NPCs will know they can't reach it directly. This is important because the AI in Oblivion is able to go through cells, so they can try to find a way through loaddoors and other cells to reach the subspace. Starting with Fallout 3, Bethesda has replaced the path node system with a navigation mesh system, so it is unlikely this tutorial will be needed for TES 5.